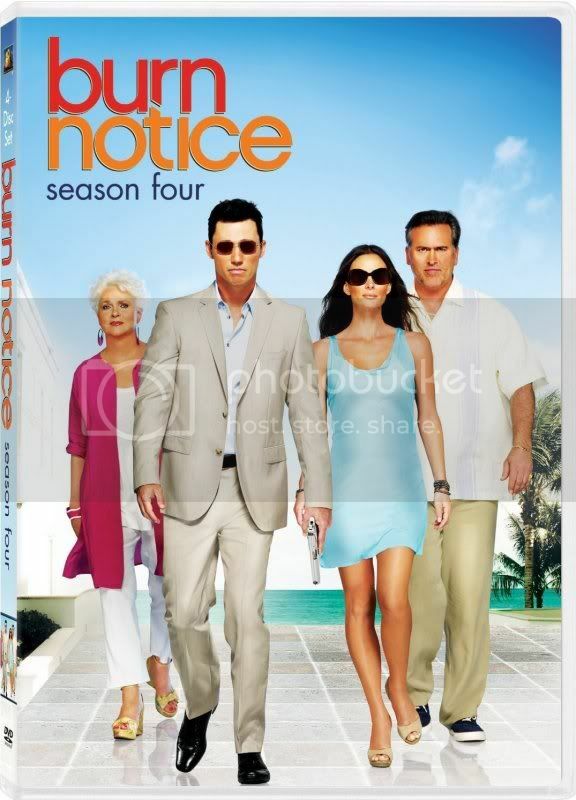 Burn Notice switched up its recipe in Season Four with the introduction of new series regular character Jesse Porter (Coby Bell), always a risky proposition made even more so by the show’s breezy, formulaic nature. Instead of tuning in for a mindless weekly adventure with longtime, familiar characters, viewers were faced with having to think about Porter’s involvement in the grand scheme of things as well as come to terms with his budding relationships with the other characters. Since USA Network shows are typically the entertainment equivalent of comfort food, Porter’s arrival was bound to be met with some viewer indigestion, but overall his integration was pulled off fairly well. I’m still not clear on why the producers felt the need to add some new blood to the successful mix (other than the 40+ age of all other leads), but Coby Bell seems like a nice enough guy and his character doesn’t destroy the show’s original chemistry. Porter is a fellow CIA operative who gets burned by alpha dog ex-spy Michael Westen (Jeffrey Donovan) during Westen’s ongoing quest to clear his own name. He’s initially collateral damage in Westen’s quest, but Westen can’t help but come to his aid as Porter sets out to find out who burned him. Of course that investigation can only lead to one place, setting up an interesting dynamic for the season while Westen assists Porter and adopts him into his tight-knit team while also trying to keep him from uncovering the truth. As par for the course with the show though, the overarching plot really only factors into each episode in the brief waning minutes, as the rest of the time is spent solving the troubles of Westen’s client of the week. Westen and his team solve kidnappings, murders, and industrial espionage cases among others this season, usually accompanied by gunfire and explosions to punctuate the action. And really, what other show can you count on in this day and age to deliver stuff blowing up nearly every week? The show’s strong supporting players continue their winning contributions, led by Bruce Campbell as boozy ex-SEAL Sam Axe and ably abetted by Gabrielle Anwar as tough and dangerous Fiona (Westen’s de facto love interest) and Sharon Gless as Westen’s brassy mom. It’s always a delight to see this cast playing off each other, even if at this point in the show’s run they’re all operating on auto pilot. The show continues to be a well-oiled machine, churning out predictable but fun stories and adding in just enough intrigue about the overall mythology to keep viewers hooked. The Season Four DVD box set includes all 18 episodes spread across four discs. The bonus features include a handful of deleted scenes, a gag reel, a feature on the stunts in the show, a funny oddity descriptively titled “Sam Axe’s Guide to Ladies and Libations”, the full pilot episode of fellow USA Network series White Collar, along with amusing roasts of White Collar by Burn Notice and vice versa. 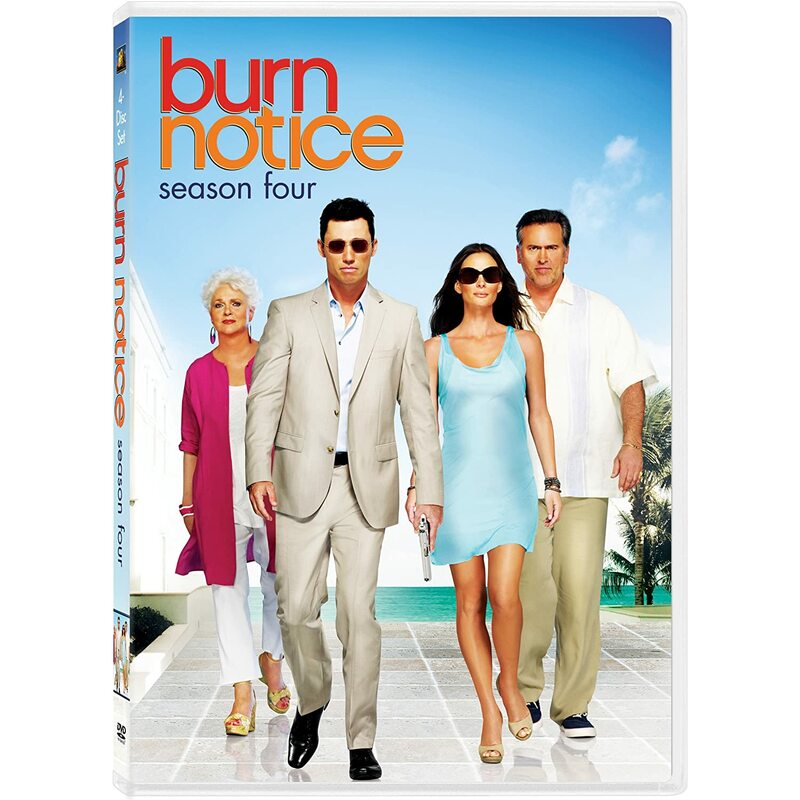 Burn Notice: Season Four is available on DVD on June 7, 2011. Burn Notice constantly remains on my list of shows I want to dig into but haven't quite found the time beyond a few snippets here and there. Only so many hours ! Always love your DVD reviews Steve !